The Berkeley Building (also known as the Old John Hancock Building) is a 36-story, 495-foot (151 m) structure located at 200 Berkeley Street, Boston, Massachusetts, USA. It is the second of the three John Hancock buildings built in Boston; it was succeeded by the John Hancock Tower. The building is known for the weather beacon at its summit, which broadcasts light patterns as weather forecasts. 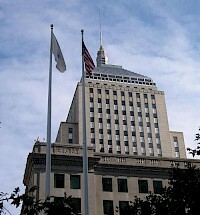 The Berkeley Building is the 18th-tallest building in the city.